Are you fearful of going to the dentist? Your dentist in Las Cruces, Dr. Ramon Ortiz and Dr. Natalie Ortiz, understands how easily both children and adults can fall prey to dental phobia. So, they have created a patient-friendly environment at Painted Skies Dental Center and offer sedation dentistry options to calm and sooth so you can get your treatments done. The result will be a happy and healthy smile! A well-documented solution is sedation dentistry. Aimed at calming fear and creating relaxation, sedation dentistry uses various drugs and methods of delivering those medications so patients remain totally calm during their preventive, restorative and even cosmetic procedures. 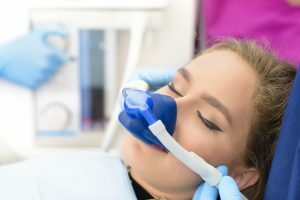 What is the Origin of Sedation Dentistry in Las Cruces? The start of sedation dentistry dates back to the 1700s when doctors attempted to use nitrous oxide, or “laughing gas,” to treat tuberculosis. Then, a dentist named Horace Wells inhaled the gas and extracted his own molar. Finally, in 1865, the American Dental Association (ADA) recognized Dr. Wells for discovering and using dental anesthesia. Over time, nitrous oxide became the anesthetic of choice, peaking in popularity mid-20th century. Laughing gas has a reputation for relaxation so complete that patients become giddy. Your dentists recommends it for individuals needing light sedation for dental procedures of all kinds. Oral conscious sedation is a more recent addition to sedation dentistry. In short, it administers tranquilizing medication such as Valium, Versed or Halcion is taken in pill form. It allows patients to feel calm or even to take a nap in the dental chair. Taken before a dental procedure begins, these sedatives produce a slight amnesic effect, too. Patients may not even remember their procedures. The doctors carefully evaluate each patient’s health history, including surgeries and medications, before recommending any sedatives. They also monitor the patient’s vital signs and comfort level as they administer the medication. If fear of the dentist stops you from getting exams, cleanings and procedures important to your oral health, explore sedation dentistry with Dr. Ortiz. Please contact Painted Skies Dental Center to book a consultation, and Dr. Ortiz will explain your options and answer all your questions. Learn how fear-free going to the dentist can be.